The American Buffalo, or simply Gold Buffalo, is a 24 carat (‘karat’) one-ounce gold coin struck by the United States Mint. It’s design is based on the Indian Head Nickel. The coin is legal tender with a face value of $50. It has been available as Proof and bullion, and in 2013 as a Reverse Proof to celebrate 100th anniversary of the James Earle Fraser design. The US Mint had already created a gold coin in 1986, the Gold Eagle, which is 91.67% gold. To compete with other country’s pure/fine gold bullion coins (such as the Canadian Gold Maple), the Gold Buffalo was launched in 2006 with a gold content of 99.99%. 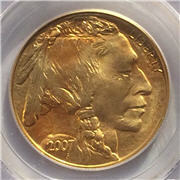 The obverse shows the head of an American Indian and is a modified design of the one created by James Earle Fraser (1876-1953) for the Indian Head (or Buffalo) nickel (Type 1) in 1913. The image is a mixture of three chiefs from different tribes who modeled for Fraser. You can see on the coin, just below the head and date, is the letter ‘F’ for Fraser. On the Proof coins only is a mintmark (‘W’ for West Point Mint in New York). 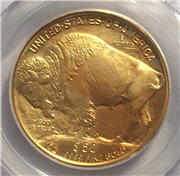 The reverse shows a buffalo (or American bison) standing on a mound, from which the coin gets its nickname. Diameter of the 1 ounce coin is 32.7mm and is 2.95mm thick. The edge is reeded. In 2006 the coin cost $800 but because of the steep rise in gold the Buffalo was over $2,000 by 2011. Due to this high cost of gold the US Mint introduced fractional sizes in 2008 as $5 (1/10th oz), $10 (1/4 oz) and $25 (1/2 oz) to make the product more affordable. 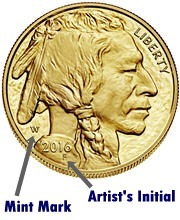 The 2016 Gold Buffalo debut price was $1,590 for the Proof and typically 5% over spot for the bullion coins. My thanks to Max Hughes (M J Hughes Coins) for allowing me to photograph the coin. 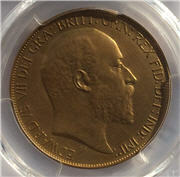 M J Hughes Coins buys and sells gold coins.